Susan Gibbons and Tammy Tebo, members of the Amvets 282 Auxiliary, organize the prizes for the kids' carnival games at the Family and Freedom Festival on Saturday. 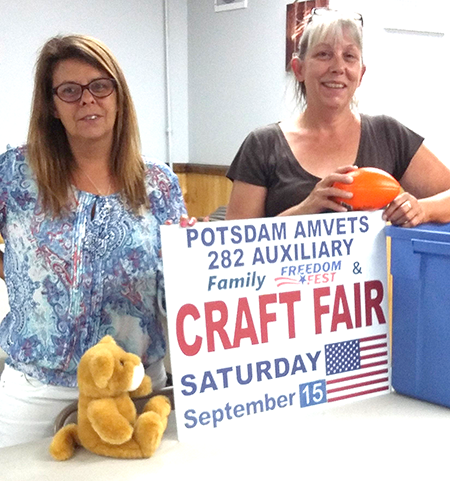 POTSDAM -- Amvets Post 282 and Auxiliary is hosting the Family and Freedom Festival on Saturday, Sept. 15 from 10 a.m.-3 p.m. at the post at 6771 U.S. Highway 11, next to Hospice between Canton and Potsdam. The festival, held to promote patriotism and respect for veterans currently serving and those retired according to the Auxiliary, will feature a variety of family activities. Horse drawn wagon rides by Double Percherons, Kids’ Carnival games, and a kids’ only Karaoke contest, quality craft fair, bake sale, raffles, and more will be accompanied by a live broadcast by MIX 96. Lunch and beverages will be sold. Troops stationed at Fort Drum will be at the post to meet the public and demonstrate some of the modern equipment and vehicles they use. Flag etiquette and disposal of old flags will be taught by Post 282 Commander Fay Sheldon around noon. Carnival games are 25 cents each. Carrots for the horses are $1. Rides are free.